SmartDesignServer is software program which enables Creo to become a complete on-line Design-to-Order system, without the need for lengthy and costly development. SmartDesignServer provides the communication pathway needed to develop integrated automation platforms and manage the data communication between the different integrated applications. Any third party interface allows sets of parameters to be calculated and stored in memory. After data transfer is initiated, Creo is activated and the data is passed to the generic models. 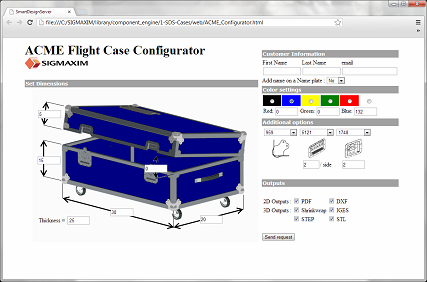 All Creo deliverables can be exported automatically (model files, Creo drawings, DXF, etc.) and delivered to the user. 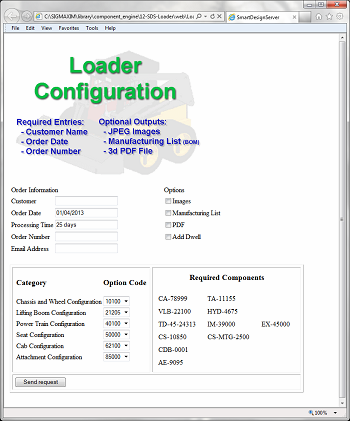 SmartDesignServer is the keystone to build a web-driven, Creo-based, customized product configurator. It completely manages the data transfer between the client’s application or browser and a server. It fully manages the Creo interaction on that server and handles the reporting of the requested deliverables back to the client. The Java based platform and the underlying XML messaging layer allows a smooth integration with other major players in a company’s engineering system. SmartDesignServer is the messenger in this automated environment. Automating the whole development cycle from quotation to production delivers complete intelligent model structures, bills of materials, and all order related documentation in seconds. This architecture is an extremely powerful way to gain maximum productivity. The open architecture of Creo allows companies to write their own applications and connect with Creo using SmartDesignServer. SmartDesignServer brings the ability to modify complex parts to users who may not know how to create them. It allows users to edit dimensions and enables modifications without requiring complete knowledge of the design intent or geometry. A single Creo user can manually create a generic model with related documentation and geometry that can be used to generate different versions of a product. Automated parts and assemblies make it possible to manage features and components to rebuild geometry. New users or even the sales team can make predefined changes to complex models without first having to sort through the entire design to find the correct feature or dimension to change.